The upzones are part of Mayor Ed Murray’s Mandatory Housing Affordability program, which allows developers to build taller and larger buildings in certain areas and requires them to help create affordable housing. Upzones proposed for more than two dozen neighborhoods next year would change Seattle’s landscape by giving many areas a more urban character, says a report released Thursday. But they wouldn’t have a significant negative impact on elements of city life such as transportation, open space, tree canopy, public services and air quality if accompanied by mitigation measures, such as higher parking fees and more street trees, the report says. It says the upzones, in tandem with new affordable-housing requirements, would generate more than 5,500 rent- and income-restricted units over 20 years. Those are some of the findings in a Draft Environmental Impact Statement (DEIS) by the city’s planning department. The upzones are part of Mayor Ed Murray’s Mandatory Housing Affordability (MHA) program, which allows developers to build taller and larger buildings in certain areas and requires them to help create rent-regulated units. Developers can build that housing themselves or pay fees. For an interactive map, go here. For static maps and other information, go here. 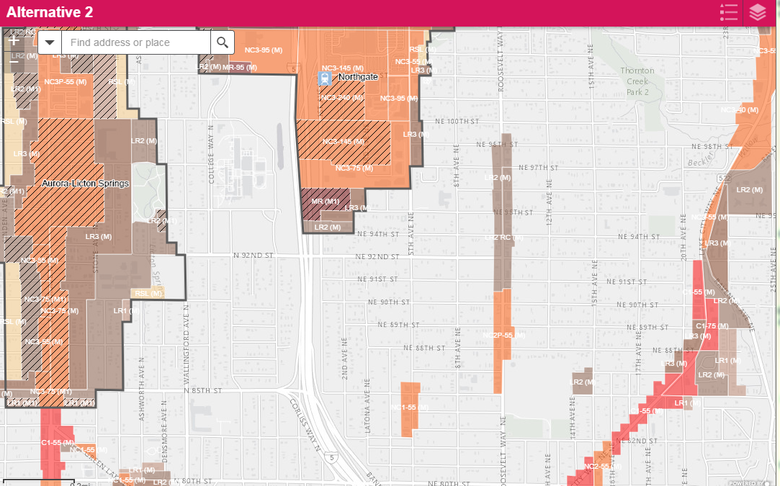 The City Council has so far approved MHA upzones in some neighborhoods that already are very dense: the University District, downtown and South Lake Union. The council this year may also pass MHA upzones for the Chinatown International District, certain Central District intersections and Uptown (Lower Queen Anne). Thursday’s report covers upzones of up to a few stories in additional neighborhoods, from Crown Hill to Columbia City. Most single-family neighborhoods in Seattle would be left alone. The changes are proposed for 27 areas designated years ago as urban centers and urban villages. These already have apartment buildings but may also have some blocks currently reserved for single-family homes. Additionally, the boundaries of some urban villages would be enlarged. And beyond urban villages, some scattered areas with good transit access would also see upzones. The affordable-housing requirements are based on neighborhood and scale of zoning change. Developers would need to devote 5 to 11 percent of their buildings to affordable units or pay fees of $5 to $32.75 per square foot. Thursday’s report considers three options for the city: no upzones, upzones distributed according to the city’s existing growth pattern, and upzones distributed in a new way. Under the third option, there would be smaller-scale upzones in neighborhoods such as Rainier Beach, where residents are at greater risk of being displaced and have less access to opportunities such as jobs. 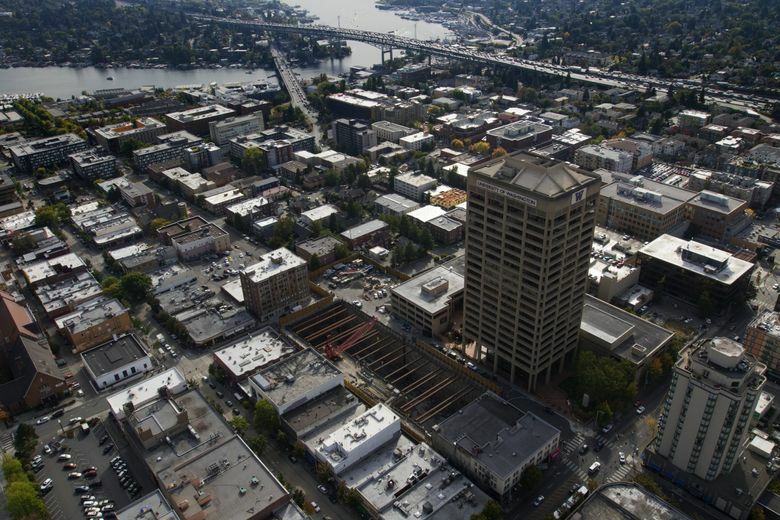 There would be larger-scale upzones and more development in wealthy neighborhoods less at risk for gentrification, such as Wallingford and Ravenna. All three options could accommodate the city’s planned growth, but moving ahead with the upzones would better accommodate more, the report says. The upzones would lead to more teardowns, but each demolished home would be replaced with 14 new homes, on average, rather than 10, the report says. The DEIS suggests ways the city could mitigate the negative effects, such as a new bridge across the Lake Washington Ship Canal to absorb traffic. The planning department will host an open house and public hearing on the DEIS at 5:30 p.m. June 29 in the Bertha Knight Landes Room at City Hall. It expects to complete a final Environmental-Impact Statement in September. The department is taking comments online and has more information there, including maps of the proposed upzones. “Your feedback will help us finalize our recommendation on how to guide growth with additional affordable housing, while working to reduce displacement risks,” said Sam Assefa, director of the planning department. What issues does the department consider controversial? The question of how to deal with displacement, the upzoning of blocks with single-family homes, and the proposed extensions of urban-village boundaries. Another question is whether the developer requirements are too high or too low.